Discussion in 'Survival' started by SniperCharlie, Feb 28, 2011. This is a list of single player maps you can easily download and play.If you have a world you want to share or find any that is not posted here,please post it.Some are adventure maps that you must play by the rules of the map(check rules link)if you want the best experience(some may not be finished). If you're on Windows, you'll need to open up the Minecraft appdata file. This can be easily done by opening up the command line, accessible by Windows+R and then typing %appdata% into the command line. This opens up your appdata file, and minecraft will be in there, named .minecraft. 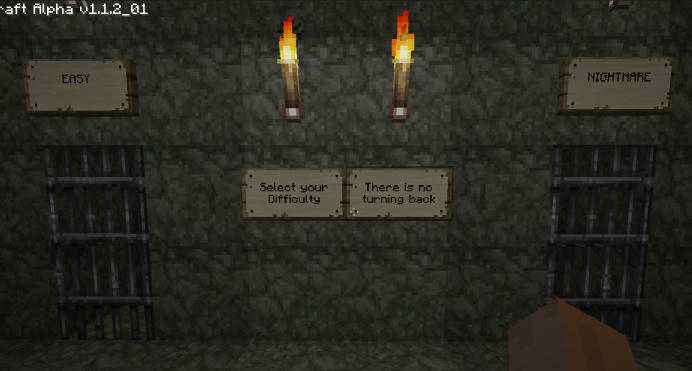 Or: Start -> Run -> "%appdata%/.minecraft" -> open the "saves" folder. If you want to do this manually,go to tools > folder options and allow hidden folders to be viewed.Then go to "C:/Users/YOURNAME/appdata/roaming/.minecraft/saves. 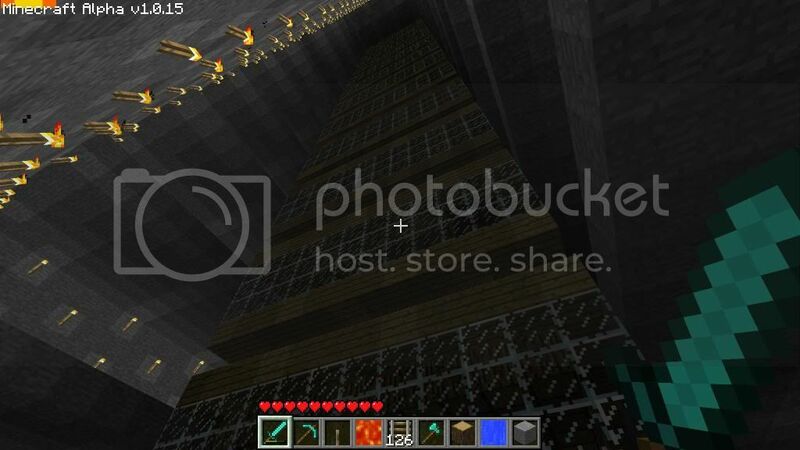 As soon as you open the .minecraft file, you should be able to see a folder named 'Saves', open this up and you'll see your saves neatly labeled 'World1' 'World2' and so on and so on. You can put as many saves as you want in this directory since the last update allow many save files be selected from the game. If you want to share a save file with someone else just copy one of the files in the save folder and upload it for free to your favorite hosting site like http://www.mediafire.com/ , http://www.megaupload.com/ , http://www.rapidshare.com/ or the one you like the most. Some save files are from older versions of Minecraft and must be converted. 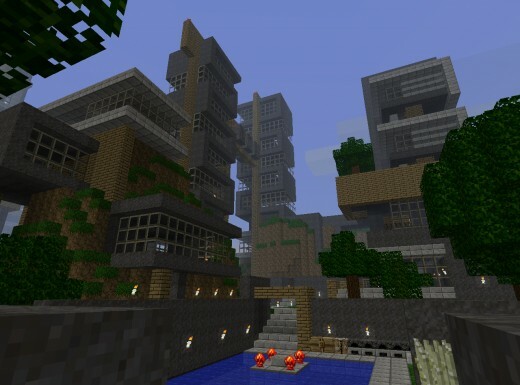 Short description:'Moderncraft' is a city of modern wonders created by someone who eschewed the temptation to build yet another medieval castle. Short description:I have put together a compilation map, with structures gathered from various saves. Structure, towns, cities, houses large and small, towers, castles, statues what ever I could find. There are so many wonderful things out there I thought it would be cool to put as many as I could find all on one map. Short description:Big mob tower trap similar in construction to my own.Doesn't give the amount that say in the video but still is enough). Short description:-its the year 2013 the world ended 4 months ago you are one of the suvivors as you travel across plains mountains deaserts and oceans you build up your stockpile of supplies dodging mobs of monsters that survived. but one day you find a man who looked like he was attacked he was about to die but before he did he told you that there was a city about a week away that had tons of supplies.... Well its been 2 weeks and you've found nothin but want to keep goin. if you find it then youll have to defend yourself against mobs while harvesting resources that have been overlooked by roamers once you get enough resources fix the city and make withstand the true test of time. Short description:-You start aboard a boat as the sole survivor of a mysterious calamity. Unable to sail the boat by yourself, you must find a way to survive when there is no land in sight. 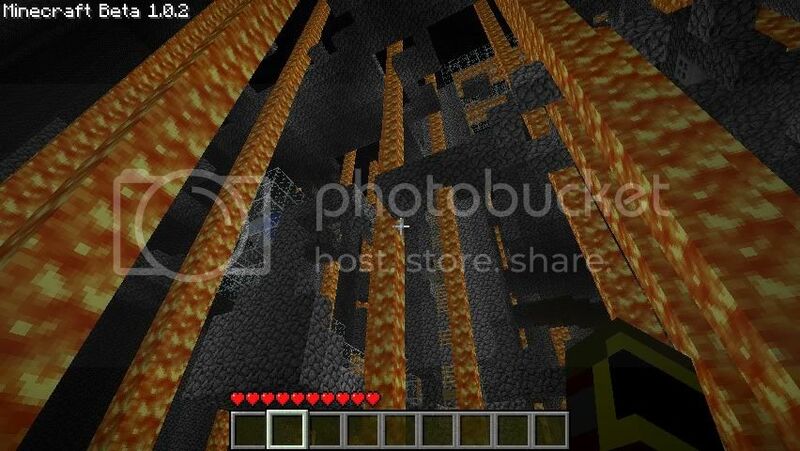 Short description:-In the later years of humanity me and my family built a portal to the nether realm in our large military base. My father and uncle than went into the portal to build us a home while my mother watched me and cared for me. Once our home was set up we all went in, and began to live there for many months, then years. In which our food supply ran out, and my father and uncle went back to the normal world to find food. By then we had lived in the nether realm so long my mother's lungs could not stand the nethous air, and she developed lung cancer, but since we just lived as the 4 of us, none of us being doctors, did not know this. My mother diseaced. But I being old enough to watch myself for quite the while, I waited on my own and played with my toys. Short description:-After Being Abandoned by your crew, Sergeant Pepper found you. An old captain himself he was willing to get you on your feet. So he gave you a sword and got you a room in Pevensy Bar (soon to be Inn) and bought you 2 boats. that lie there on the dock. He also said something about how their was a secret bit of armor in the bar. X marks the spot. Short description:-Betar is a world that gives a good RPG feel to life. The Betar Town has many places to explore. Buy a house from the real estate. Or even buy a shop to start earning money and move up in the world. Build outside of the city. Short description:-In Broville there is plenty to see and do. There's hidden treasure, forgotten tombs, secret rooms/passages, lost ruins, and of course the town itself! 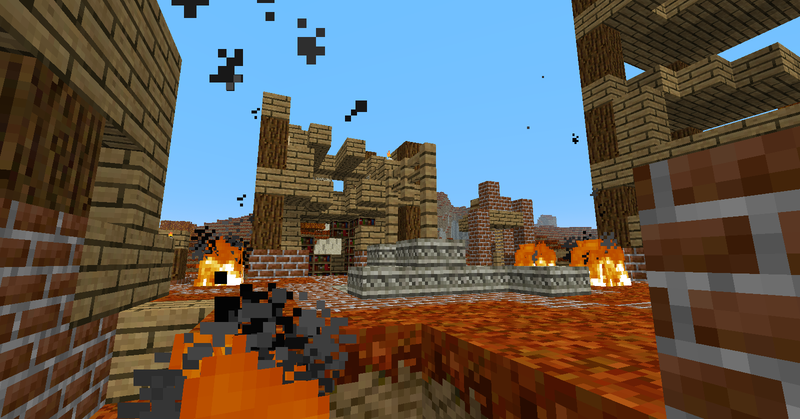 Whether you like exploring, looting, building, or destroying, Broville is the place for you. Short description:Hey guys this is a map i just created alone. It's kind of based off of the Escape Craft series. Short description:-You have to find 9 diamonds in the castle to escape. Short description:-You wake up in an empty halllway with the eerie hum of fluorescent lights in your ears. You look down the hall the to see darkness enshrouding the hallway beyond a door. Groans echo through the hallways while you scavenge for supplies. soon you are fighting for your life and uncovering the mysteries of THE COMPOUND! Short description:-You are trapped in a city which is shrouded in darkness. Your Goal is to bring daylight back to the town, and kill whatever caused it. You will have to take one of the two city routes that have been laid out, and try to get to the end. The map itself is very simple, there are no puzzles or anything, just obstacles. The difficulty of this map really lies with the darkness and the monsters. 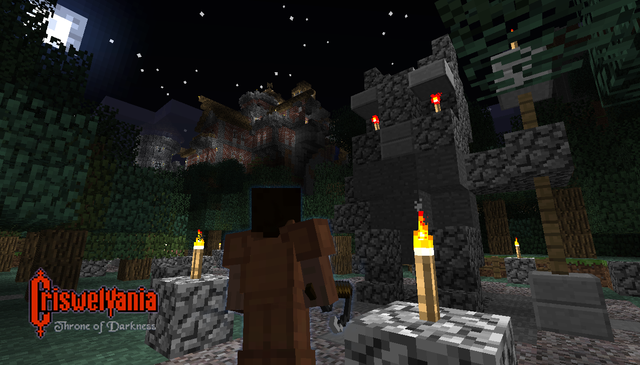 Short description:-Criswelvania is an homage to Konami's Castlevania series of games. Fans of the original NES game will note that every level and even the overall progression of the first Castlevania has been in some way interpreted in this map, and many elements from Simon's Quest, and CVIII, Super Castlevania IV for SNES, and Symphony of the Night make appearances as well. Short description:-Map has: Traps! Dungeons! Puzzles! Secrets! 5 hidden chests with diamond gear tucked away along the "path" of the game. (and a very satisfying noise will signal when you find one) A story (made with .txt files) that gives you hints/maps to the next area of interest. Platforming! Plenty of monsters and good times. Short description:-You slowly open your eyes, and find yourself staring at wall. Your cheek is flat against a soft, comfy bed. You roll around, and jump off the bed. Looking around, you see that you are inside a hotel room. You can't remember anything, but you don't like the situation. The door is locked, and the "bell" that is suppose to call for help is out of order. What now? Short description:-"You awaken in a small room. Strange messages are written on the wall. Only one thought is on your mind. Escapecraft is a room-escape puzzle game, Minecraft-style! Decipher clues, solve riddles, exploit the idiosyncratic physics of everyone's favorite game! Short description:-"You awaken with a head-ache in an oddly familiar room. You are wearing a jumpsuit with the number 1090 printed across your chest. As a chill races down your spine, you search for the exit..."
Escapecraft 2 is the second installment of the Escapecraft series (oh yes, there will be more). This version features more than a dozen new rooms-o-puzzles, 2 different endings, 50% less rage-quit, functional respawn, minimal game-ending failure penalties and more corny videogame-clichÃ©s than you can shake a stack of 64 sticks at! Its time to get out of here." -Escrapecraft 3 is the third installment of the Escapecraft series. This version features dozens of rooms, 2 endings, a custom texture pack and even more devious puzzles from everyone's favorite villain - Herobrine. Short description:-This map is one of the few adventure type maps available now. You can download it and try to solve all puzzles and clear all challenges! So far it has about 25 min of gameplay and many interesting and unexpected puzzles (including things that were added in beta 1.2) but if you have any ideas for a new puzzles please let me know and I'll add it in next version. Short description:-You wander, as usual, alone in this broken world. As the day begins to turn into a night, you see something that makes your heart skip a beat: Remains of an old fortress. The crumbled walls haven't definitely been built by you. Curious about what kinds of secrets the ancient stronghold might hold, you delve deeper into its deserted halls. After descending a stairwell ravaged by time, gripping a lit torch in your one hand and a longsword made out of iron in other, you reach an old hall in which the food seems to have been prepared for the inhabitants. Short description:-The Four Towers map is a attempt to create a story based Adventure. You wake up alone in a tower prison, you must escape, find your family and crush the tyranny. Follow the signs and have fun. Everything has been tested multiple times so it all should work. Short description:-I've always thought survival mode was a little easy, even on Hard. So I made this generously sized, hellishly themed map for my own pleasure. Though, I figured I should share it, as I'm sure there are others who would enjoy it. So here it is! -I included a goal into this map that you may choose to complete. There is a small opening in the adminium shield, when you find it you will gain access to the rest of the world (which is decidedly non-hellish). So get out there and Escape From The Bowels Of Hell! Short description:-A short adventure featuring several puzzles/traps often resulting in death when you fail. Dying always result in having to delete the world and put the downloaded one back again. There's even a reward for those who finish. Short description:-As an archeologist working for the British museum, you've seen your fair share of ancient relics and old ruins. But none of those can measure up to your latest mission; the long-lost tomb of Pharaoh Kuthemnakh. You received word of its discovery three days ago and immideately boarded a plane to egypt. Pharaoh Kuthemnakh is rumoured to have been buried together with the "eye of war", the worlds biggest sapphire. When the game starts, you've just gotten your tent set up and you're ready to venture into the strange temple. 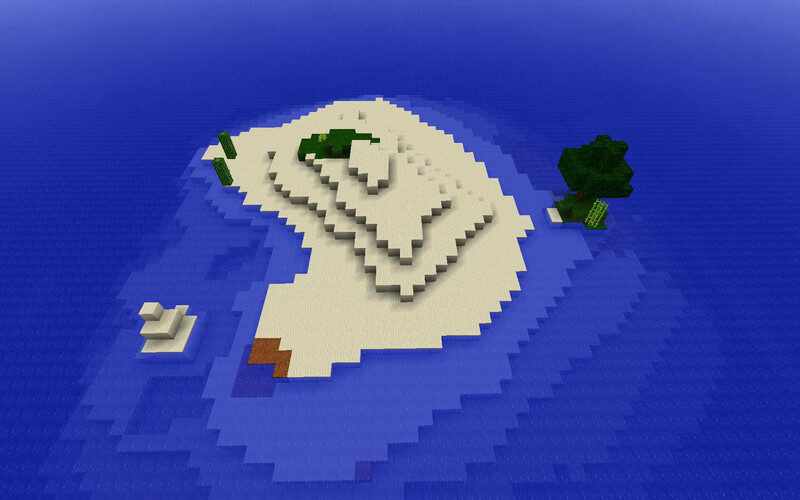 Short description:-You start out on a small island with some cacti and a tree and try to survive. Short description:-Jamesopolis is a city that 2 guys named James (and one guy named Chris) have worked together to create. It's a LOOOONNNGG way from finished mind you, but there are some hidden goodies and stashes of things, lots of things to explore.... and there'll be more on the way since this is just the first version. Short description:-The Labyrinth is a dungeon involving the player battling through a variety of rooms, each with its own style and challenges. This is a map meant to be played in adventure mode, a game-type which Notch plans to release eventually. However, it is perfectly playable and very fun even now! 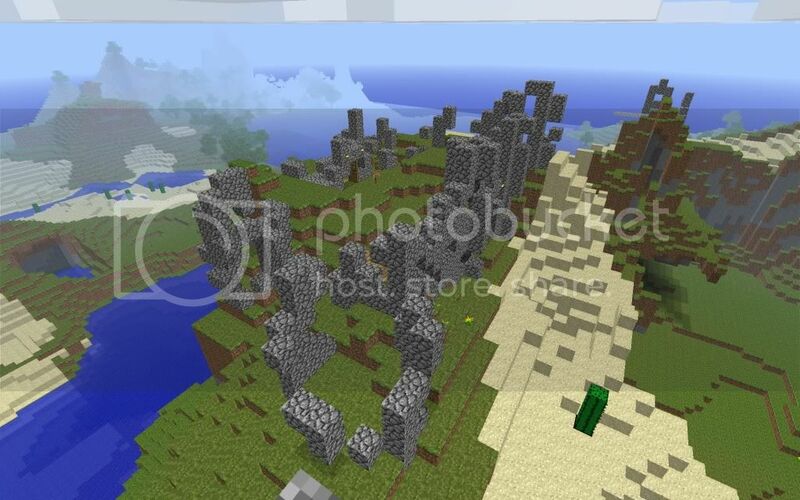 Obstacles in this map involve battling through waves of mob spawners, jump puzzle areas, climbing levels, mazes, minecart obstacle courses, and more. Short description:-Well, I spent all day today finishing the fourth level and bugtesting the map. There's still a bit that needs to be fixed, but other than that I think it's ready for an early release. The map is unfinished and ends rather abruptly--there are only four levels, currently--but I may as well release it now since I have finals/exams coming up and I'm not sure if I'll have the time to do a release till much later. FWIW, I've added maintenance chests in the checkpoints in case creepers blow the map up and break the game. This is a better alternative as opposed to just not having creepers at all, I think, which is what I did in the Labyrinth 1. Short description:-An adventure/story map that I made! The background story is, your (you are playing as Lunos) village was invaded and taken over by the Cryptos, a secret group of deadly soldiers, when you were seven. Now you want to be free and you and your friend Sarcos must travel to Magnum Silvis, the base of the Cryptos and bring an end to their organization. Short description:-You, Lunos have been captured and must escape the Cryptos' Prison. Facing puzzles and challenges, you wonder if you will make it out alive. Short description:-The map's been auto generated by a map generator that I built. The generator converts every tile of the Zelda overworld into 3x3 Minecraft tiles, resulting in a 768x264(x128) map. Note that some parts are scaled differently, such as the L1 and L4 islands. At their original scale, they would make lake Hylia look more like a river than a lake! Short description:-Hey everyone. I'm new to the forums and wanted to show you something that I've been working on for few evenings now. I just recently finished playing through Mass Effect and Mass Effect 2 and came up with an idea of doing a Minecraft version of one of my favourite places in ME2, Nos Astra. Short description:-Survive like a real genius or die like a ragdoll. Short description:-I love exploring peoples saves. 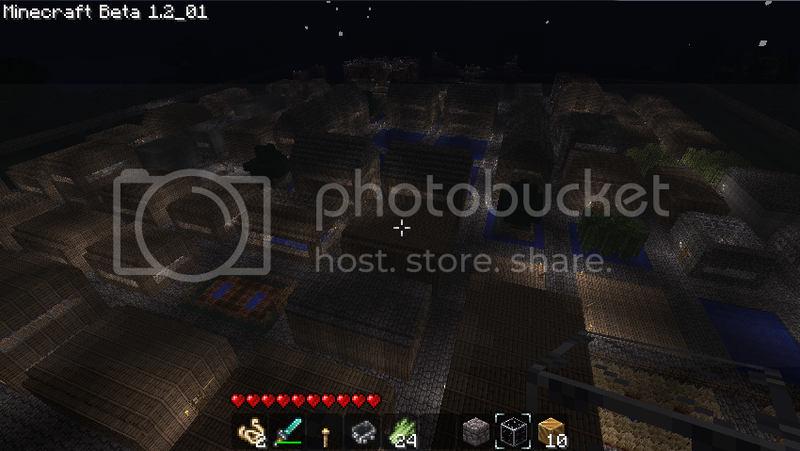 Mine is a bit big but it comes fully loaded, bases, buildings a huge mining system and several mob dungeons. Also has an abandoned castle ruin complete with a dungeon full of treasure, dozens of hidden chests. I would love feed back on the dungeon. I do use skin mods but no cheats. If you die just follow the signs back to the castle.. I have added some more to the dungeon, trying to go for interactive. Short description:You get to play the part of a very whipped boyfriend on every woman's favorite holiday, more or less. Estimated play time is 30-90 minutes, the map isn't a walk in the park. Good luck and enjoy. Short description:-Will you continue the journal? 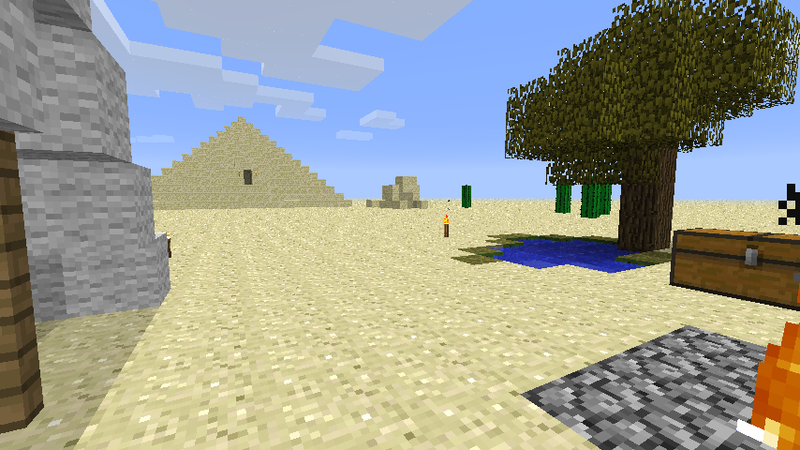 Behold, the pyramid of Minecraft! Inside are treasures beyond your wildest dreams, and traps and challenges that will put your skills to the test! Are you up for the challenge, or will you end up... DEAD! Short description:-The challenge is to steal the treasure from the pyramid, while limiting yourself to only being able to dig and place sand blocks. Breaking any other block, including sandstone, is not allowed. Naturally you are still allowed to kill MOBs. There is some adventuring equipment in the chest, at the camp outside the pyramid. * Secrets everywhere, including 2 records hidden in main areas. 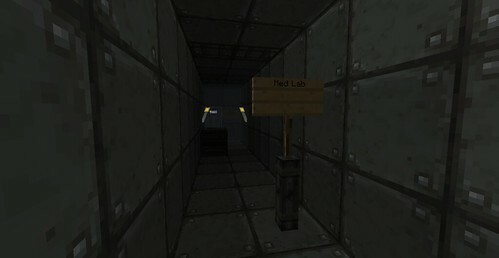 * Redstone puzzles, jumping challenges, and maze-like castle corridors. 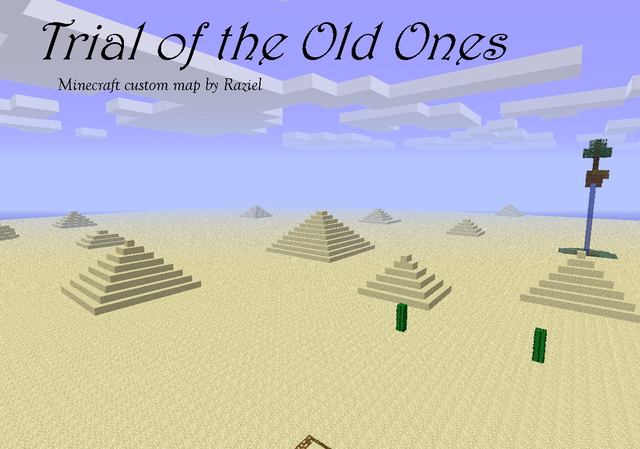 Short description:-Hello All, This is my Adventure Map, Obviously Called ' Ruins Of The Forgotten Adventurers ' This Is The 1.0 Version. 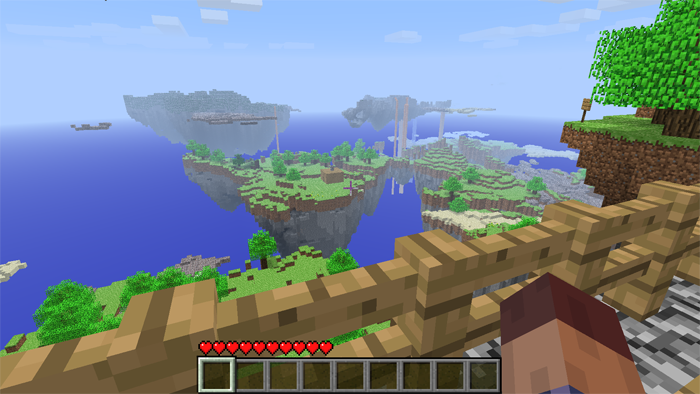 Short description:-Skylands is a custom tailored world for the Alpha version of Minecraft, a game of exploration and building in a virtually never ending procedurally generated world. 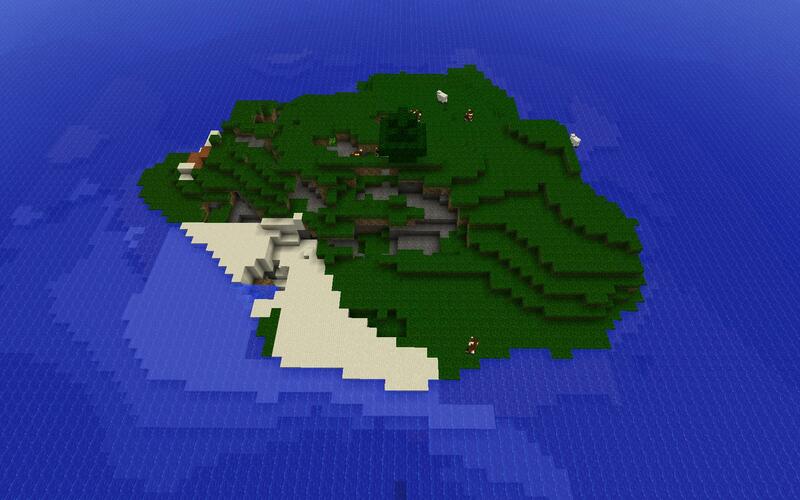 Short description:-After playing the original Island Survival created by wookie4747 I was inspired to try and create my own.This island is slightly smaller than 1.1 and has normal sized, naturally spawned ores. Good for beginners and peaceful mode builders. Short description:More challenging than Version 1.0. The land mass has increased by 20% and the initial starting ore sizes have been reduced. The optional resources (cactus, reed etc.) are still there, but they have been hidden below ground. This version also includes 5 hidden bonus challenges not found in 1.0. If you don't care about playing the challenge, please disregard the signs. Short description:This was my first attempt that never got posted. There is a lot of grass but the initial starting resources are limited. As in 1.1, the optional resources (cactus, reed etc.) are still there, but they have been hidden below ground. I made this map before I added the optional challenge mode so there are no hidden bonus objectives, but there is a treasure left behind by the Lost Curator. Short description:-Can you find the Lost Block? Solve the puzzles to progress. Short description:-You are a thief. New to the idea of stealing for your own benefits. A test has been created for you. Only the most determined and smart of you will succeed. In this scenario you will be tested in your abilities of jumping, problem solving, memory, and overall skills. If you pass you may go on to the much more difficult and real-world tasks of thieving. Short description:-Hello all, dueler001 & Deanox here, ready to show off our new map we've created, it's a puzzle map with various rooms with traps/puzzles in them which the player must complete to continue through the map. The map isn't themed it's just room after room, trap/puzzle after trap/puzzle, because it originally started out as just throwing around ideas for puzzles we could use, then it turned into being a proper map we are wanting to release. Short description:-You wake up in the middle of nowhere surrounded by sand. There are many pyramids around you, each holding a different secret. Your objective is to find your way back to IceVille. However, creatures calling themselves the Old Ones, have put many challenges in your way. The desert holds many secrets, one of which is a place called the underworld. Will you find your way back to IceVille and how long will you survive? Short description:ceVille is burning, the Underworld is collapsing. You make your way to the surface and find out thing have changed since the last time you were there. It has been a year since the Old Ones abducted you from IceVille and put your trough series of challenges. Creature called the Shadow is crawling trough the desert, always one step ahead of you. He is the one the Old Ones were preparing you to face. But are you prepared or is it too late? Short description:-In honor of the Survival Island Challenge that Yogscast recently played, I decided to make a version of that where you're started underground with very few materials and forced to survive down there. 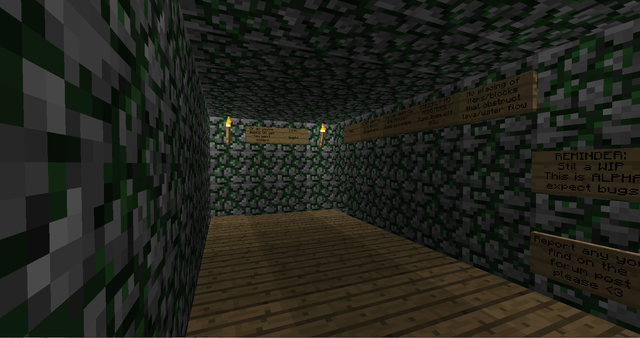 I also covered the top of the map with bedrock so you couldn't escape. This is my first map, and I'm excited to see what you guys think! 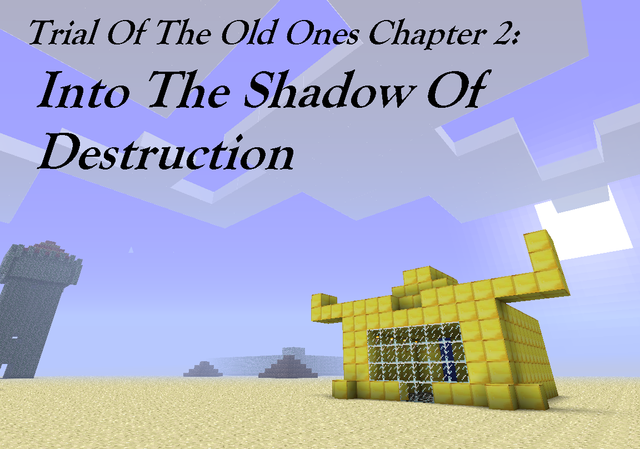 Short description:-This is a playable dungeon for Minecraft inspired by the awesome Zelda series. It is based on jumping puzzles, riddles and logical thinking to pass through the dungeon. I used a variety of minecraft mecanics and items to create a dungeon simular to the dungeons in the Legend of Zelda games. Its completly playable and made up of 4 main parts, each with their own theme and mecanics. The total playtime is about 2 hours with a steady increase in difficulty. Short description:A set of fantasy themed settlements with theirs own uniqueness with occasional 'useful' structures. Short description:The longest wall in minecraft I have ever built or even seen. This is an awesome thread! I love organized threads There are many worlds here I want to try, specially the "survival islands" that is a challenge I always have want to try! EDIT: Maby I should share our map so everyone could explore it in SP? Whoa Charly:O amazing thread as always! Thanks guys.I recommend that compilation map and of course that survival islands is all a new challenge(remember to play by the rules ).Some can be finished really easy if you cheat,but that's not funny so if the creator says no placing blocks or stuff like that,do it(the same for the recommended level of difficulty.For the griefers out there go to Broville and torch it or whatever. XB,try scapecraft,but most adventure maps have some puzzle. If someone want to share a save file here is the place. P.S. :I think the server save should be only for members or staff.Or make a save file only in request because one can go in single player and search for everyone chests and then go to the server to reveal those secrets or abuse. Short description:A fiendish combination of lethal traps, mind-bending puzzles and lava. Short description:A 5-star hotel. It has four stories, a portal, a swimming pool, 6 rooms, three fireplaces, 3 couches, 1 chair, numerous chests, a logo, and a complicated redstone system requireing you to give one block to get in! Short description:Bet stands for Big Epic Treehouse. It has the main attraction, the treehouse, a town to the west, TheOneGaffer's Castle to the south, and many other smaller attractions including a hedge maze, a blimp, (The one from Aldona) 2 mob factories, a large farm,a Mega-Hotel with a theater and a indoor pool, many housing units in the town, shops in the town, and a large underground mine with floating torches. Oh and a giant tower of bookcases. I had too much papyrus. 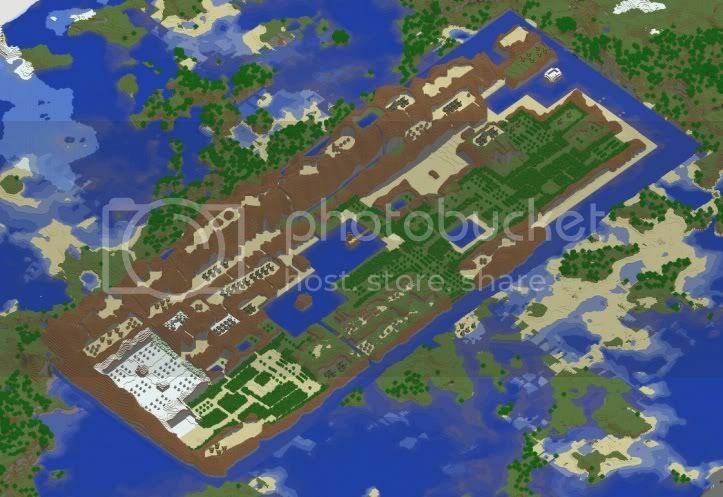 So in this map obviously I used INVedit, as well as MCEdit. I will be posting .schematics for all of my creations shortly. I figured I might as well treat you nicely, so make sure the difficulty is on normal, and check out the battle arena and mob factories as you are invincible. Oh and all your tools are infinite. Have Fun! Short description:My single player map. The first castle was a legitimate build. For the second, I used INVEdit. There's more to the second castle than meets the eye... have you traveled to the basement? Short description:Just a rollercoaster I made in ~eight hours, since my nephew was bugging me to make one! This is an old save, before the increase in the rarity of diamond/gold and caves. I would've had some cooler stuff in it otherwise. It's not anything amazing, although I think the underground mine I made is pretty impressive (it's all legit, not edited) - it actually spans almost the entire continent I'm on. Short description:I'm quitting Minecraft to spend more time with my 4-month old son. I just need someone to take care of my beloved world, cuz I'll sure miss it. 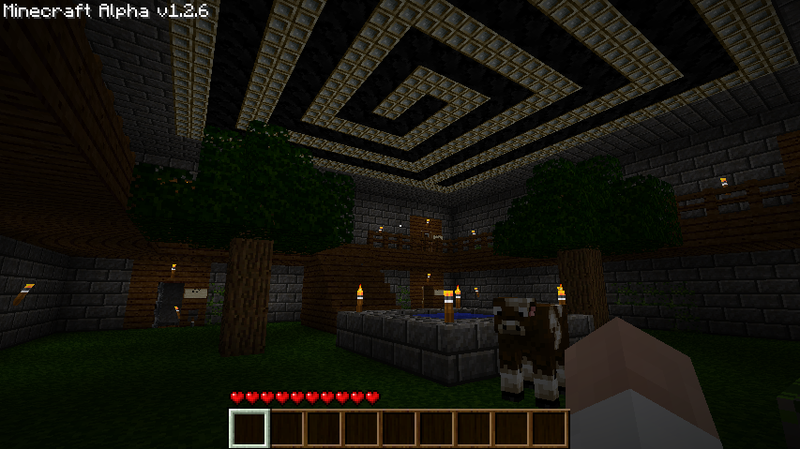 This is a good world, gently lived in, with all the basics you need (connected portals, connected railway, tree farm, small mob spawner, wheat/sugar farm, branch mine). And I really love my modern home, complete with Hot Tub! So hopefully someone out there will enjoy it. Short description:A map that can lead to riches or death and destruction. Short description:This was my first world in Minecraft and it is awesome! It has some very deep and complex cave systems, as well as neat geographical features such as floating islands. I've built a castle on one floating island that is connected to my main base via a two- way tram system. I've also done some exploring and set up a few random outposts here and there. There is a tunnel on the coast near my main base that leads to a couple underwater domes I've built as well. Some of the coolest areas are east of spawn. Short description:Generated using BiomeMod. Huge canyon desert. Short description:My world. cool, eh? Short description:The Daibutsuden in the Todaiji Temple in Nara, Japan. Unfortunately you will not find a giant Buddha inside. It measures 57x50 blocks (1:1 Scale) and was completely hand built in ssp. There is no floor btw. Just so you know, the castle in this set by Breny Beast is not Hogwarts. Also, Hogwarts is being made by Potatoorgy and won't be released until it's finished and will only be playable in multiplayer and not through save file. Well,I saw the world release from this and I see the castle so I posted here.But that kind of detail I cant know.Still is a nice save.Thanks for the details. P.S. :When they release the thing,post it here . Short description:12,345 TNT blocks in one huge cobblestone ball. Short description:A castle built on a cliff overhang. A road from the spawn has been provided. Short description:Get from the bottom to the top, I dare ya. If you are afraid of heights do not attempt to play this map. Short description:Escape the labyrinth the way you can(griefing allowed). Short description:The beginnings of a medieval kingdom. Legitimate build. Everything connected via tunnel. Short description:An empty fortress sitting on a floating platform. Short description:yes it is a minecraft classic normal map but their is not very many classic map downloads on the internet. enjoy this map still has caves underground you just have to dig for them. Short description:MMM stands for Max's Midnight Mansion. It comes complete with a large adminium testing facility, A duengeon with 3 traps, a large cannon platform, a (Failed) mob trap, a FIREWORKS platform, and a throne room. All of this and more in some of the deepest canyons you will ever see! Short description: You have arrived at the remote port town of Redmurk, surprisingly there appears to be noone around and further exploration reveals the town to be empty. A look around the nearby homes shows signs of struggle yet there are no signs of battle or disaster.